Many of us face the blahs when it comes to our home decor. But it can be pricey to redecorate, especially when boredom is our only justification. There is a solution: Use what you have. Armed with pen and paper, walk through your home. Is there one room you want to tackle first? Let’s say your family room is bothering you the most. Look around. What needs to be done? Tired of the dark wood paneling? Is the couch’s upholstery looking faded and dull? Are the shelves full of junky items and books crammed together? Remember that notepad? Write your findings down. This will begin your action list. Now it’s time to inventory what you have to decorate with. Go through your attic, basement, closets, and every other nook and cranny. Here are a few of the things to look for: photos, pictures, calendars, frames (both with and without artwork), plates, china, baskets, candle holders, silver, furniture, fabric, gardening things and antiques. Keep an open mind. Old shutters and iron gates look great hung in the right spot. That old stained tablecloth can be bleached or dyed (even tie-dyed), or you can decorate it with ribbon edging. Next, go find some decorating books and magazines — borrow them from a friend, buy them, or go to the library or a bookstore. As you leaf through the pages, you may be surprised by what inspires you. Perhaps you will find that you really like bold primary colors, yet have lots of neutrals at home. In your notebook, jot down your findings. These notes, magazines, and pages torn from old magazines are the foundation of another decorating tool: the three-ring notebook. This notebook is where you’ll also store paint chips, room drawings and everything else project-related. Do what professional decorators do: Create a plan on graph paper. Every square on the paper represents one foot. Measure your room and furniture. Draw squares, rectangles and circles that approximate the measurements of the furniture. Next, decide the room’s colors. You can work with the colors of your upholstery or change the color scheme by throwing a pretty quilt or throw over your furniture. You can also purchase slipcovers at many stores inexpensively or on sale — see some slipcover suggestions here! You may want to paint your walls or your paneling, because nothing lightens and brightens more than paint. Using your paint store’s expertise, experiment with a quart of paint before buying a full gallon. Paint one section of your wall, live with it for a day, and note the effect at different times of day. Then you’re ready to purchase the gallon or two of paint you’ll need. Fabric adds to your room’s personality. Go to a decorator fabric shop and cut swatches, which many shop allow you to do, or buy the smallest amount you can. At home, drape them on your furniture. Get several samples — what appeals to you in the store may look different in your home. Try something unusual that you secretly love. After you’ve arranged your furniture, and determined your color scheme and fabric choices, it’s time to place your pictures, mirrors, and other accessories. Go back to your decorating notebook for inspiration. Read your action list to see what else you wanted to do. Then experiment. 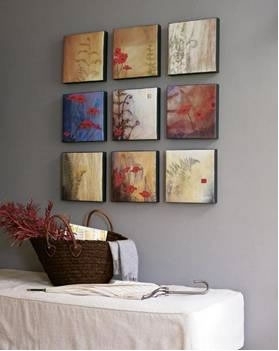 On your wall you can group like items together, such as a montage of old family photos or a grouping of plates. Paint old or unsightly frames to coordinate with each other. All sorts of things are framable: photos, calendar art, children’s artwork and thrift stores finds. Collections can give your room a more finished look. 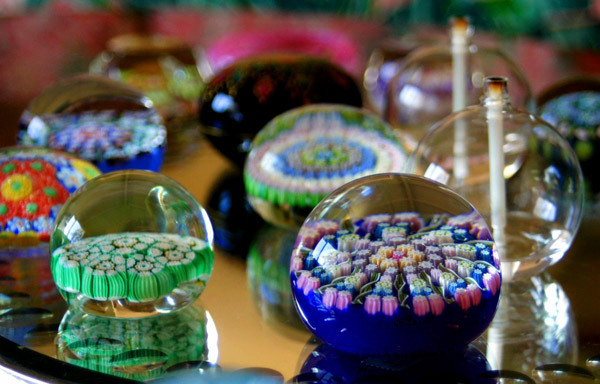 A collection is anything you have more than one of, such as glass paperweights (shown at the top of the page), candlestick holders, photo frames, painted boxes, tea cups or dolls. Show the world what your interests are. Shelves are a great display area, in addition to holding books. Instead of cramming books in, place a coffee table book upright, facing outward. You can place four or five books normally, using smaller books placed flat as bookends. On top of the bookends, place objects, artwork or family photos. This process doesn’t end. Good decorators use the evolutionary style, allowing a home’s personality to emerge over time. Now, knowing you can add to or change any element at any time to refresh your living space any time you like, sit down with a cup of tea and enjoy your lovely home.